Are you trying to book a Florida holiday but can’t find October 2020 Orlando flights? Prices are released 11 months before departure, but it’s not too early to book. We provide advance rates for Virgin Atlantic, BA, United and Norwegian. Contact us today for our best price on October 2020 Florida flights. Can you leave in the first 10 days of October? Early October fares are excellent. Fly direct from Manchester or Gatwick. Glasgow departures are more expensive because of the Scottish half-term; book early for best value. Planning to fly half-term October 2020? The weekends of 17-18 October 2020 and 24-25 October 2020 are the peak dates. If possible, avoid departing on the weekend – fly Monday to Thursday for a better price. If you’re stuck with the busy departure dates, an indirect flight is the most economical option – Heathrow and Manchester have early departures that arrive in Florida around 5pm. Can you wait until the last week of October? Flights are decent value – especially mid-week departures. Avoid weekend flights. Tuesday and Wednesday departures offer the best value October 2020 Florida flights. On peak dates fly indirect from Heathrow. If you’re returning to Manchester in late October, flights will be busy. An indirect return flight saves money. We achieve great prices on October 2020 Orlando flights without compromising on quality. We book with the major airlines such as Virgin, Norwegian, United and British Airways. We monitor fares as soon as the airlines release their prices. As prices fluctuate, our expertise allows us to snap up seats at the best moment. Advance bookers benefit from our method. Book your October 2020 Florida flights now at an excellent price. Heathrow has the most departures, so prices are very competitive. Even peak dates are excellent value if you can depart mid-week. Glasgow, Edinburgh and Manchester also offer indirect flights at decent value. We book connecting flights from the smaller UK airports for an additional fee. Newquay, Exeter, Isle of Man, Jersey, Belfast, Aberdeen and Inverness all have convenient schedules. Baggage is checked straight through to Florida. Most customers opt for an Orlando International arrival – its location in the heart of Florida is handy for Disney and Universal. You may prefer a Miami, Fort Myers or Tampa arrival – prices are sometimes better value on peak dates. Let us know your preferences on our online enquiry form. How much do you expect to pay for your October 2020 Florida flights? It’s Halloween season, but don’t let high street prices give you a fright. Follow our advice above and you could achieve fares of £425 per adult and £350 per child – even on peak half-term dates. October is a busy time in Florida, so an advance booking is recommended. Book now and we’ll have plenty of time to find you a great fare. As soon as flights are released, we check fares daily and grab your seats when prices drop. 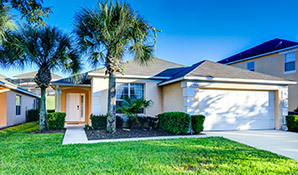 We also book car hire and accommodation for the complete October 2020 Florida holiday package. For more information, enquire online or call us on 01934 319 851 for an instant quote. Book with a deposit of just £100 per person. All our October 2020 Florida flights and holidays are ABTA and ATOL protected. Fly to Florida in October 2020 and stay for two weeks in an Emerald Island villa. Drive to the attractions in a fully-insured car. All from just £795 per person. Emerald Island is a prestigious resort right next door to Disney. It's so close you can see the fireworks over the Magic Kingdom from your doorstep! World-class shopping and fine dining are nearby. Book today with full ATOL and ABTA protection.